Select the valve type from the drop-down list box. 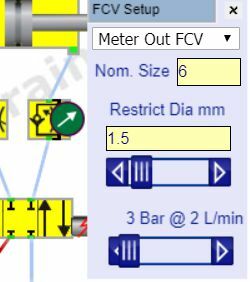 The symbol will show which way round the valve is installed, so look at the circuit to determine whether you have a meter-in or meter-out, just in case the actuator is upside down. The restriction diameter is the size of the control orifice in mm. Adjust the flow slide bar to see a typical pressure drops across the valve.